Previous Zero to 180 posts have highlighted the strong cultural connections between Kingston Jamaica and Cincinnati, Ohio, as evidenced by (1) the radical rocksteady funk of Prince Buster‘s 1966 tip of the hat to “The Cincinnati Kid” himself, James Brown, as well as (2) the Jamaican LP from eight years prior – The Wrigglers Sing Calypso at the Arawak Hotel – in which the band (led by Ernest Ranglin) covers groundbreaking King Records composition, “Bloodshot Eyes,” a Top 10 hit for both Hank Penny (C&W chart) and Wynonie Harris (R&B chart) in the early 1950s and thus an “early landmark in racial integration” (Wiki). In 1967, Prince Buster was touring the UK (where “Al Capone” was a Top 20 hit), as well as the US to promote his RCA Victor LP Sings His Hit Song Ten Commandments. How fascinating then to discover that the “Cincinnati Kid” singer himself would end up seeing one of his productions being released on James Brown’s label, ultimately. These two songs, of course, were not recorded in Cincinnati’s King studios but leased from at least one other label. This 45, as far as I can tell, was King‘s sole venture into Jamaican pop music. Funny how one additional letter added to a song’s title can so profoundly impact the meaning of the song itself. 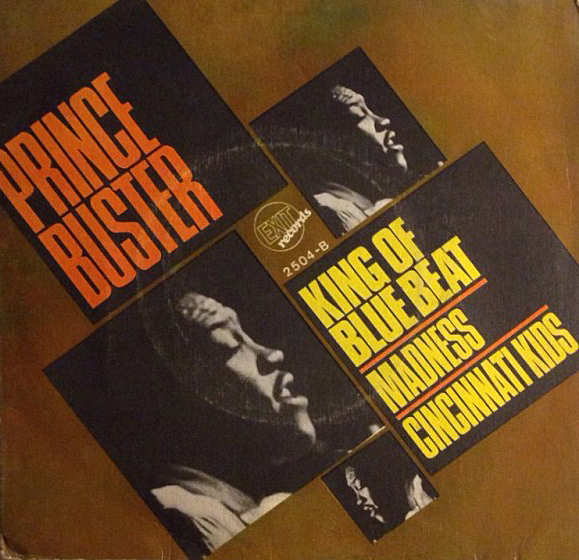 Imagine Spain’s citizenry in 1968, for instance, trying to make sense of Prince Buster’s 7-inch release, “Madness,” with its flip side, “Cincinnati Kids” !